Raymond Premru was an internationally renowned composer and brass player. From 1988 until his death in 1998, he served as professor of trombone at the Oberlin College Conservatory of Music. Born in 1934 in Elmira, New York, he graduated from the Eastman School of Music in Rochester. 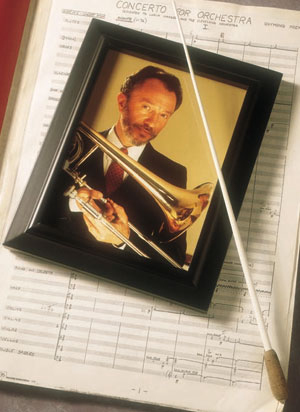 Moving to England, he served for 30 years as bass trombonist of the Philharmonia Orchestra of London, performing under the world’s leading conductors. His keen interest in jazz led to his co-founding of the Bobby Lamb/Ray Premru Big Band, and to a 26-year association with the celebrated Philip Jones Brass Ensemble. He also recorded with the Beatles, the Rolling Stones, Pink Floyd and Frank Sinatra. His teaching engagements included the Eastman School and the Guildhall School in London, and he conducted widely. Premru’s compositions include, in addition to much music for brass and jazz groups, two symphonies—the second commissioned and premiered in 1988 by Vladimir Ashkenazy with the Cleveland Orchestra. The same ensemble commissioned Premru’s Concerto for Orchestra for the 1976 U.S. Bicentennial, and premiered it under Lorin Maazel. Other conductors who have led Premru’s music are Riccardo Muti with the Philadelphia Orchestra and André Previn with the Pittsburgh Symphony and the London Symphony. Raymond Premru was always concerned with communication, with making direct audience contact. He said that he hoped to have produced something to make the listener’s efforts worthwhile, and to have provided music of value and inspiration for a wide range of hearers as well as fellow performers.